A radar reflector is used to help make your vessel more identifiable by other boats and ships that use radar to scan for vessels as well as other obstructions. In the world of radar reflectors there are many, many options. For sailboats the options are narrowed down a bit, but there is still much controversy over which ones are the best, in what conditions and why. What makes a radar reflector good in our eyes is: #1 how well does it reflect or bounce back a radar signal in varying conditions and circumstances, #2 how practical and sturdy is it to install on a sailboat mast. Clearly there are many factors in how a radar reflector performs; wind, rain, heel, elevation, type of signal, I am sure there are even more. Here are a few articles (click here and here) that get into the science of it all. In terms of performance you will need to do your own research to see which reflector suits your needs the best. I would like to take second and talk about the reflectors we have installed the most of and their pro’s and con’s in terms of rigging. Mobri – A favorite radar reflector of ours for a long time mostly from an installer’s point of view. When properly mounted, they are neatly tucked out of the way of the sails and rigging. This is why we like them so much. Yes, these don’t have the best performance, I’ve come to find out, but we always rig these in pairs (which may improve the performance results? ), one on the port stay and one on the starboard stay. This of course makes the reflector twice as expensive. We only recommend these for boat’s with at least two sets of spreaders so that they can be mounted to the intermediate or D2 shrouds. We will use seizing wire to properly seize them to the stay 12″-24″ up from the spreader. You’ll need two flag halyard blocks installed on the lower spreader of your choice. The outboard flag halyard block should be at least 18″ in from the O.B. spreader end. The other will need to be installed as in-board as feasible. You will need a small horn cleat installed on the mast (not the shroud!) to tie it off. Run at least an 1/8″ double braid flag halyard through the blocks on the spreader. Tie the end coming off of the OB block to the top of the reflector. Tie the end of the flag halyard coming from the in-board end to the bottom of the reflector. Lift the reflector to about chest height and cleat it. Lash the reflector to the upper shroud, pulling it just slightly closer to the shroud so that it is not parallel to the stay (this is the key to getting it all tight once hoisted into position). TIP: You can tie the downhaul portion of the flag halyard over to the mast cleat to give you something to lash against. CLICK HERE AND ZOOM-IN TO GET THE BIG PICTURE! Firdell Blipper – This is probably our least favorite radar reflector that we install. It is another face-of-the-mast mounted design which uses very flimsy mounting brackets. These brackets are almost always bent, damaged or missing. We only recommend using these if they are guaranteed to be well protected from the effects of a tacking jib. Although these are much lighter than the Tri-lens you still don’t want it to come crashing down on deck! On top of that, this reflector seems to be one of the weakest reflectors of the bunch according to the product testing sources linked above. Although there are many more products out there worth researching and we will gladly always explore new products and options, these are the brands that we have had most of our experience installing. Need more information or help installing a radar reflector? If in doubt, don’t forget to Contact your local rigger for assistance. Do you have any experiences with radar reflectors? Don’t forget to Share your thoughts below and thanks for the read. Thanks for the useful article! Buying a boat equipped with a Mobri and will consider adding a tri-lens for passages. Also AIS is a must! Are you still giving away t-shirts? I’d love one if so. Thanks for the read and the kind words Rory. We are OUT of shirts!! Sorry, I wish I had one for you. Keep checking in with us, we’re always getting new swag for giveaways. Just a comment from another industry: I fly for the airlines and all jets these days are equipped with TCAS, or the traffic collision avoidance system. This is an active collision avoidance system where TCAS equipped aircraft talk to the installations on other aircraft sharing altitude and airspeed information. If the TCAS computer senses that it’s safe zone has been breached it will provide the two aircraft in question “traffic advisories” along with an audible warning. If no action is taken and the two jets continue to close on each other, a “resolution advisory” is issued giving the two pilots opposite avoidance instructions to avoid a crash. This has virtually eliminated midair collisions between commercial aircraft. Of course, you have a little less time to see and react when the closure rate is 1000 knots, but it is a tremendous system. Given my experience with TCAS, I’d really recommend an active collision avoidance system, particularly if you spend any time around commercial shipping regardless of the prevalance of fog in your area. As far as trying to McGuyver something, I would think that the lids of tin cans would work better than tin foil. In fact, if you had a few of them and some reflective tape you could probably come up with an approximation of an Echomaster in a pinch. My question would be, do any of these barrel or inflatable reflectors double as mast flotation in case of capsize? Haha! I have my own troubles with that Alain. Even though the Firdell Blipper has a very buoyant look I wouldn’t trust it as my anti-capsize device. Perhaps that’s what any of these are good for. Seems rather controversial…this whole radar reflector business. Thank you for the chuckle and for taking the time. Yes the Echomaster is quite effective if hung in the RAIN CATCH ATTITUDE, that , despite your claim, is NOT shown. Hung as shown by one corner is a rain SHEDDING position! The reflector needs 2-3 attachments so a ‘ CUP’ is formed at the top…hence ‘rain catch position’. When hung this way the other reflecting surfaces of the side pockets are more likely to bounce the radar signal back to its source (acting like a prism) than a flat vertical plane which are unlikely to be square on to the signal source Tilting will make it worse where the rain catch angles will still work. Area is important as is the flatness of the surfaces and accurate corner assembly. As the article suggests we are no experts on radar reflectors or their performance, but just wanted to speak to some of the more functional ways of rigging/installing the various products so that they do not interfere with boats sailing systems as well as provide safety for the crew below on decks. Therefore, it is our belief that once the reader chooses the radar reflector(s) and follows the manufacturers guidelines along with our points on mounting them to a sailboat mast, they will have a product that is not only functional but will provide the user with years of trouble free use. Readers are always urged to get more product specific information directly form the manufacturer. You can get more information on how to properly execute the Echomaster here…. The Radar reflector is one element of the measures boat owners should take to ensure that they can see other marine traffic and most importantly be seen by other marine traffic. It is clear from the Qinetic report on radar reflectors following the tragic loss of the yacht Ouzo south of the Isle of Wight on the 20/21 August 2006 that boat owners need to select a radar reflector with the biggest possible reflecting area to ensure that they can be seen by radar equipped ships. Furthermore the report confirms that the performance of the Echomaster and Mobri is rather poor and states that poor solutions whilst giving owners piece of mind may in fact do little to improve the boat’s visibility on radar! Cost and ease of installation should be of no importance in the debate. Consequently I would select the Tri-Lens readar reflector if I was selecting a passive reflector but a much better option (confirmed by the Qinectic report) is an dual band (X and S) active reflector such as the Echomax Radar Target Enhances (Echomax Active XS) or the SEA-ME Dual Band which are highly recommended in the Qinetic report.. I have a Firdell Blipper in the top of my mast – above the forestay, so out of the way of any sail. It has been there for 20 years now so your comments on the brackets sound strange to me. I sail on the very busy North Sea and I have never heard of ships or coastguard stations unable to find me on their radar. As a matter of fact I have hardly ever had to alter course when crossing shipping lanes because the other ships see me long before I see them and it seems they think my boat is much bigger then it really is (only 22 ft). So I have great confidence in my Firdell Blipper and already have one handy to mount on my next boat. It is good to hear a success story with one of these. As the article says there is much controversy surrounding the many different radar reflector options. These are just the view points as we’ve experienced them. Putting the reflector above the headstay is a great idea…probably why it has lasted so long and works so well. There is nothing to mess with it up there and from what I understand the higher the better. In regards to performance we know really very little hence the three articles cited that conducted testing on the various products. That’s a big reflector for such a small boat no? 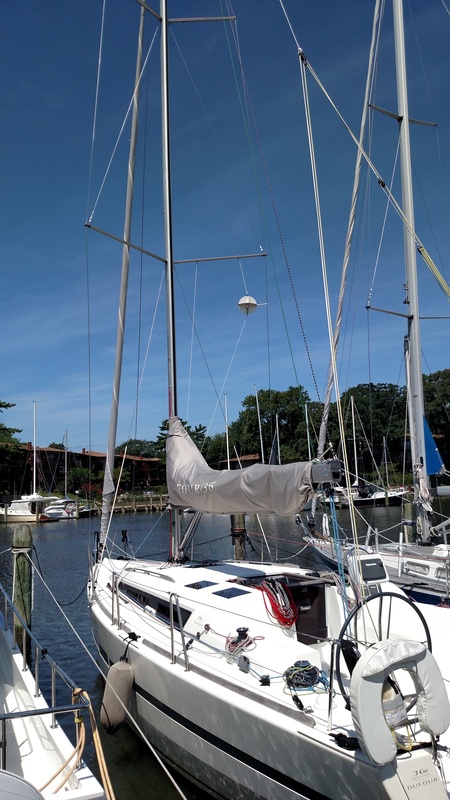 What type of 22′ sailboat is this? That’s a smart boat delivery captain in my book. Thanks for taking the time Rick! The Canadian Coast Guard and Practical Sailor also did test years ago and the small tubular reflectors did very poorly. We formerly operated a charter fleet and I would never install a Plastimo or Mobri. After a strong wind one night, I came onto the float and found pieces of a tubular reflector which had shattered. They are easy to mount, however virtually useless, especially when heeled. Viki. the bag of foil would be of no help. You need precise 90 degree corners to reflect the radar signal. Thanks for the comment. No question on the Mobri having tested poorly, all three of the linked sites say so too. As I said we just like these from a rigging point of view. Perhaps mounting two, as we always do, would improve some of these test results? Also, in my experience these are usually improperly mounted….almost always, hence they can come crashing down; this is the case with anything though, right? Not a one, in ten years of rigging offshore boats has come crashing down at least unbeknownst to me ;-0) Remember, we feel the key with these is to have them installed on a diagonal shroud so that when the boat heels at least one of the reflectors sits in the vertical position. I believe when used in conjunction with and properly rigged Echomaster beneath the spreader, you are really increasing your chances of being seen. 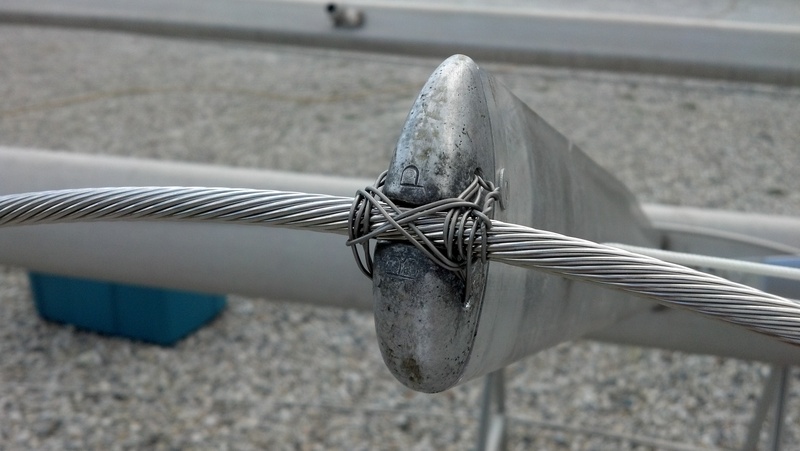 In our opinion, this combination is probably the best possible set up for double spreader masts with aft swept spreaders, overlapping headsails, forward lowers, mast mounted radars with guards, or inner forestays, to help protect the hardware from becoming dislodged or damaged by the tacking sail. Modern boats with non-overlapping headsails have much less issue here. Having said that, especially if you do have a more traditional mast with fore and aft lowers, inner forestays, or radar with a guard, we have grown partial to the Rozendal Trilens. This seems to be a top performer in regards to the testing conducted by the various agencies. Of course conditions, type of radar scanner, heel, and more, are all factors in how well they test. The Rozendal Trilens is a very good quality reflector and now that it has the second mounting bracket, is a sturdier option for the front of sailboat mast. What are some other good brands out there worth checking out for sailboat mast mounted radar reflectors? Great post! We are in the market for a radar reflector. We don’t get much fog here in the South Island of New Zealand, however we were recently sailing down the coast on an overnight trip and when the sun rose we found we were completely shrouded in fog – and had no radar or radar reflector! After posting our plight on Facebook a friend suggested we hoist a bag of screwed up tin foil up the mast, which we subsequently did. It made us feel a bit better, but not sure that it was actually effective at all! I think we will get an echo master to have on board just in case on our next coastal passage. But for our next boat – the one we sail around the world in, the Mobri does look very sleek. Thanks Viki! We have to send you a shirt or something, you are a great follower, our best for sure. Yes on the Echomaster. And 2 Mobri’s or a Tri-lens would be my recommendatio for the more permanent solution. Thanks for commenting and Happy Sailing! Lol…I really don’t know but….no I don’t think so.